TITLE: The Sabbatical Detour and the transformative capacity of coalitions. Henk is Principal for Rebuild by Design, the resilience innovation competition he developed and led for the US Presidential Hurricane Sandy Rebuilding Task Force where he was Senior Advisor to the Chair. He has been Director General for Planning and Water Affairs and Director for National Spatial Planning for the Ministry of Infrastructure and Environment. 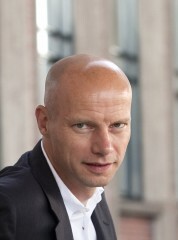 He teaches at Harvard GSD and is member of the International Advisory Board for the City of Rotterdam. He was Curator for the 5th International Architecture Biennale Rotterdam 2012 ‘Making City’, curates the debate series ‘Design and Politics: the next phase’ for Aedes network Campus Berlin and initiated the research program and is chief editor of the series of publications with NAI010 Publishers on Design and Politics.